Welfare is self perpetuating Lindsay. If throwing money at the problem would solve poverty, child abuse and poor life style choices all of these problems would have been eradicated years ago. Unfortunately the more that is spent on the uneducated, disfunctional families the easier it is for them to produce more offspring who in turn become beneficiaries and so the problem grows. It is time that the Government stopped rewarding those who keep having children even though it is obvious that they are unable to support them because they are either beneficiaries or in low paid occupations. The opinion that the world owes me a living and the Government is responsible for my welfare and I will be rewarded by getting more money regardless of my life style choices, is alive and well in NZ unfortunately and as long as this attitude is allowed to continue the worse the problems will get. This report has a lot going for it in terms of information but in fact we could do without it. Whereas welfare payments are a problem they are in fact only a small percentage of overall govt spending. The person being paid probably around $100,000 pa to produce this report would actually be doing far more good for NZ's economic condition by picking fruit for farmers. People on the govt payroll carrying out duties outside those of core government services are in fact merely working for the dole, and such people are as big a drain on the economy as welfare recipients. The key to a real economy is getting govt spending back down from the $80 billion it is today. It should be less than half that, but it won't happen until we close govt departments and lay off the people working there. Sooner or later NZ voters will have to face this hurdle. The longer the country pretends this crisis does not exist the worse will be the pain of dealing with it. By 2060 debt is predicted to be 200% of GDP. The real problem is the socialist mindset (or brain rot) that says productivity does not matter. GDP rates highly in assessing govt management of economy, productivity hardly gets a mention. Its poor and getting worse. See here for a graphic of the problem. You can make all kinds of changes to the govt, but while people still expect something for nothing, and see little need for effort and sacrifice, then the downward trajectory will continue, until they are shocked out of this mindset. Its a long way off, but it will change. The only question is how long before the change and how deep the mental shock. See Venezuela for an example of what happens when people will not come to their senses due to socialist brain rot. The Nats are bad enough. Imagine the increase in slide rate after a few terms of Green/ Labour. I have a different interpretation. Welfare is just money for nothing. It doesn't make you do anything in particular. 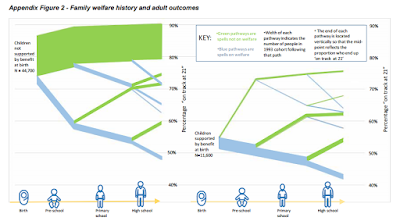 Those families persistently on welfare are those generally lacking in any work ethic/criminals or motivation to improve the lives of their kids or themselves. No surprises that they have the worse outcome. We need to mandate or hint hint strongly encourage, long-term birth control on this population. There are products out there that can provide life-long contraception- copper IUD or at least for 3 years. These people don't necessarily plan to become pregnant; they just don't plan. 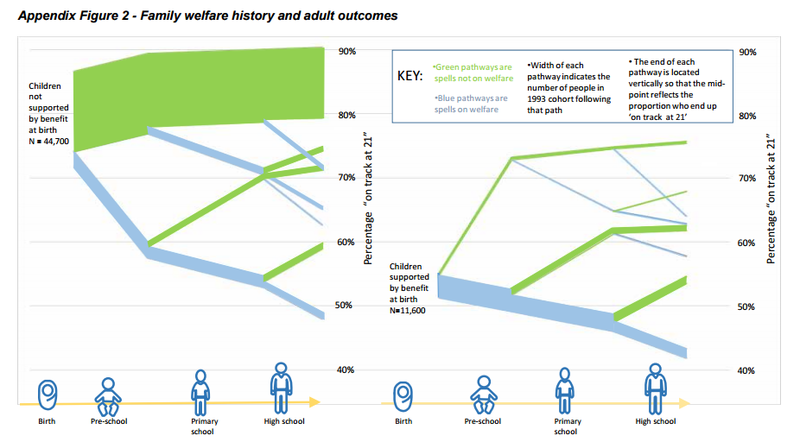 This will have the strongest effects of reducing child poverty.